Ideally every system around the world should be using the same definition of timezones. However not all systems are kept up to date when a government decides to change a transition time. In addition not all systems use the same naming conventions, so while to the human it may be obvious which timezone is being referred to, a program has to do some deductions. Most calendar applications appear to use the olson database or similar. Windows PC take a slightly different approach, with a requested time change on the first reboot after daylight saving change. Windows based application issue different timezone ID’s. What if the issuing application has an outdated version of the daylight saving changes? Would you not rather control it on your server than taking their definition? Now Sydney has daylight saving, so we are only GMT+10 for half the year. The rest of the time we are GMT+11. If we happen to choose the GMT+11 option for our setup thinking it was more correct we would be wrong…..
What windows does is technically not wrong. They acknowledge the daylight saving and you can choose to have it automatically update… WHEN you REBOOT the PC, the times will update. to applications not always handling the timezone correctly – It would be very tempting as a programmer to grab that GMT+10 and use that. Just google things like my meeting is one hour out etc to get a feeling for the problem. What does this mean for developers using calendar files? This is correct according to the spec and not too hard to deal with. The developer can grab each city and check for a matching timezone on their host system. I don’t know whether a VTIMEZONE was included or not. 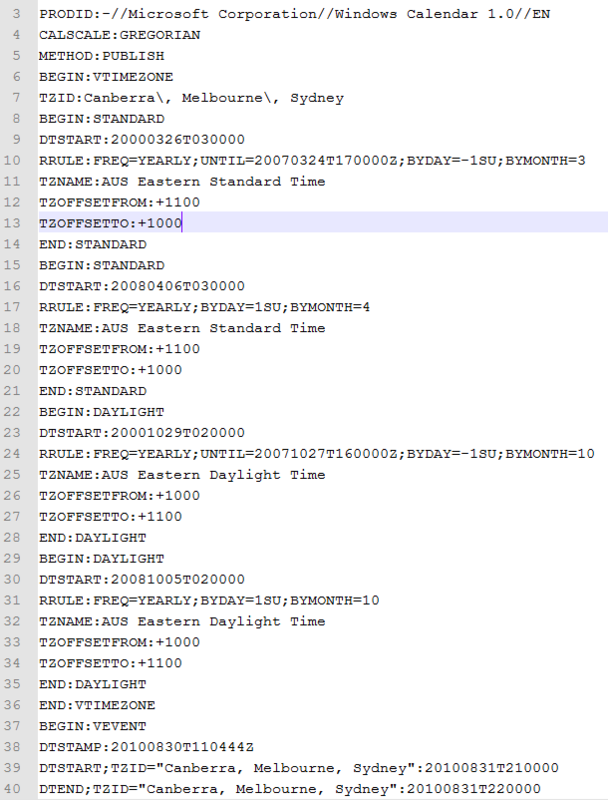 AS noted before grabbing that GMT+01 may cause incorrect times when daylight saving is involved. Somehow working with the timezone definition passed in the ics file – Is this an option ? – well maybe – I shudder to think how though. Imagine the confusion if some dates in your website knew about one set of daylight saving and others were obeying the possibly different definition in the ics file. PHP encourages us to use it’s timezone definitions. 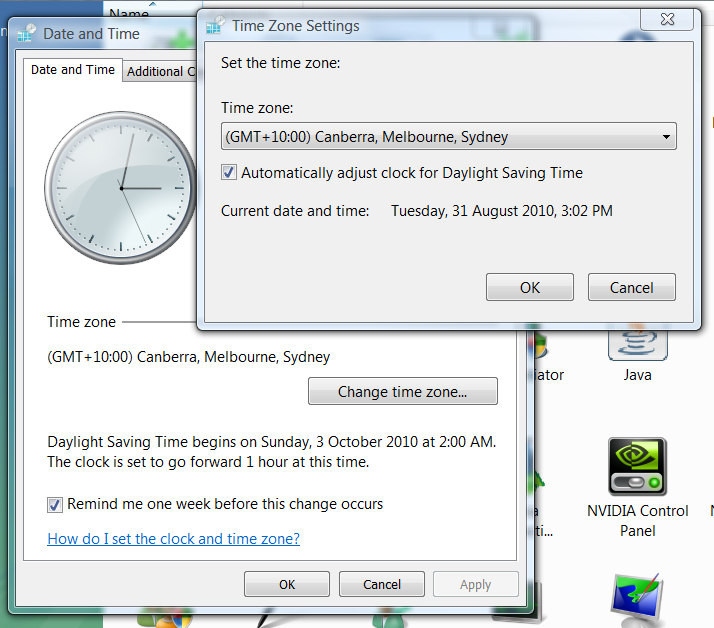 It has functions to do a variety of timezone functions, but uploading daylight saving changes into a timezone object is not one of them. (Probably a good idea too). and of course use the DateTime object class – do not mess around with unix time that breaks on old dates. Dates, Times, Timezones, daylight saving etc are so fraught with danger (see the best of dates, the worst of dates), that one must use pre-tested logic as much as possible, and there are some very useful functions there. Else if all that fails, it will just use the wordpress timezone as the base timezone for the events. This property parameter specifies a text value that uniquely identifies the “VTIMEZONE” calendar component to be used when evaluating the time portion of the property. The value of the “TZID” property parameter will be equal to the value of the “TZID” property for the matching time zone definition. An individual “VTIMEZONE” calendar component MUST be specified for each unique “TZID” parameter value specified in the iCalendar object. The presence of the SOLIDUS character “/” as a prefix, indicates that this “TZID” represents a unique ID in a globally defined time zone registry (when such registry is defined). Note: This document does not define a naming convention for time zone identifiers. Implementers may want to use the naming conventions defined in existing time zone specifications such as the public-domain TZ database [TZDB]. The specification of globally unique time zone identifiers is not addressed by this document and is left for future study.